New Content Release: Moviestorm Sword Fighting! 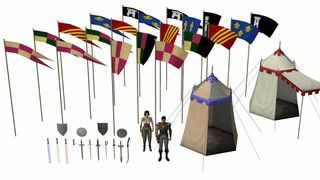 This latest AddOn features a collection of props, costumes and animations for battle scenes within Moviestorm. The pack is loosely based around medieval fantasy, with a period sword fighting costume from that era for each of the male and female characters. There are sword props (seven variations) that can be added to the costumes in the sheathed position, both on the characterâ€™s backs and sheathed at their hip, and shields to finish the ensemble. The rest (and majority) of the pack is dedicated to the sword fighting animations for the male and female characters. Thereâ€™s a total of 45 prop animations that the characters can perform alone, and 16 mutual moves that can be added to your timeline to choreograph your fights. Essentially, this means countless combinations of single and mutual sequences for your movies! This is a great addition! Congrats MS team! Buying it now. I just tried to purchase the pack and I get an error message. It could be because I changed my PayPal password and ID since the last time I purchased something here but I can't find anywhere where I can correct that information here. Ooh I love new stuff and this looks excellent. Now I just have to figure out how to buy it, since PayPal say they have no record of issues with my Credit Card but their guest card system still refuses to let me buy things! Are you still in a third world country? The system may think you're a Nigerian posing as you after getting your info from some (can't believe those actually work) reply to an 'offal'cial letter informing you of all the money you've won in the UK lottery you didn't even know you entered and you can have it all if you give them your login info for Paypal. Problem solved. I was able to purchase the Sword Fighting addon and download it fine. Glad you got it sorted, Lucinda. "The card you entered cannot be used for this payment. Please enter a different credit or debit card number." I believe Matt Kelland has a similar issue with PayPal. They are verminous scumbags if you ask me. The only solution they offered was to set up a PayPal account. That seems like coercion and/or corrupt business practice to me. Block random people from using their "guest" system, make them phone an international toll number for help and then force them to sign up for a PayPal service. It is a shame you don`t get on with paypal, hope something can be sorted for you. I've sent you a PM, Primaveranz. Now, sorry if I am missing something, but in the tutorials, I hear the clinging of swords when they fight, but when I have my characters fight, there is no clinging, does the sounds come with the pack and I am missing it or do I have to find sounds elsewhere? Check that you haven't switched off the "Foley" sounds. The foley's is on and no sound. That's very odd. Do you get footsteps and other sounds inside Moviestorm?